While we are spring ahead this week...I had to take advantage of the warmer weather last week, where taking your jacket off doesn't mean a chance of pneumonia. Yes, 50 degrees in the middle of January is warm for us New Yorkers. Even in the mornings, when these photos were taken, it was much more mild then say a week or two before. I much rather have a cool crisp winter then a freezing cold one. I love wearing hats and layers but I also like having to get away with not having to wear boots and heavy socks all the time. This outfit alone reminds me of Spring with it's brightly contrasting colors. Pink and red is one of my favorite color blocking mixes, maybe because they are in the same color family...I don't know what it is...but I love it. Do you feel like sprining ahead? 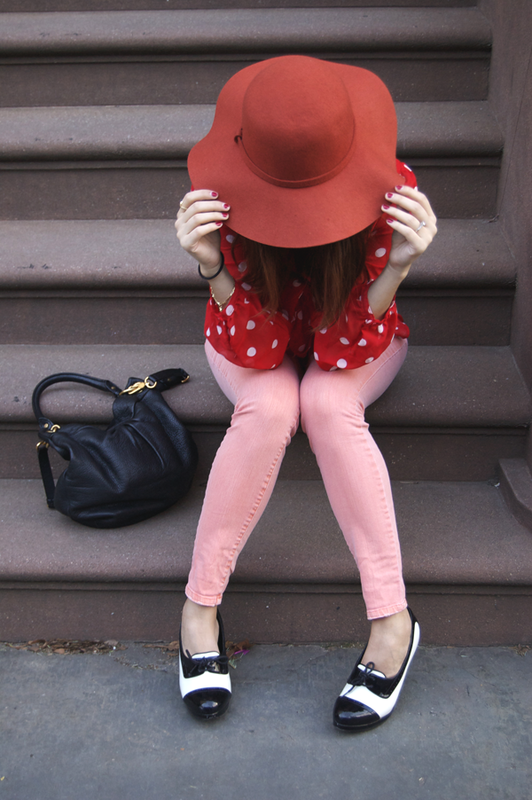 super cute polk-a-dots, love the shoes! Love the pop of color - very retro! I adore pink and red together as well - my two favorite colors! Very lovely outfit! OMG, I am ALLLLLL kinds of in love with this look, Heather!! The color is amazing, and I SOOOOO LOVE those shoes. Cute look! Loving your blouse and hat! Such a stunning outfit. I love how you've kept the color palette very simple. And the hat is so gorgeous. I am green with envy. You are definitely channelling Taylor Swift (love her!) with this awesome look!!!! Great outfit. 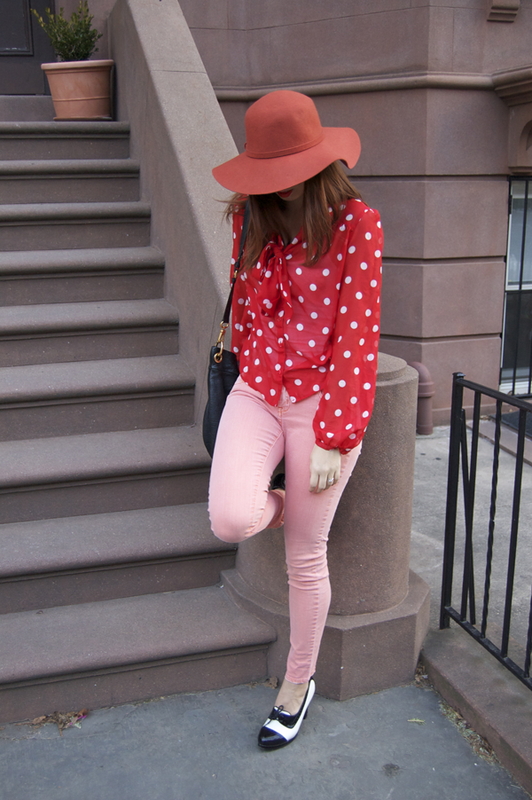 Love the polka dot blouse. i love this outfit! its perfect for valentines day! this outfit is soooo cool! love love love how you mixed red an pink! Wow you look like you could be the older sister of this girl from Disney! I can't remember her name, maybe it's Bella? Anyway, this outfit is really nice on you, I wish I could pull off red and pink! LOVE love love this hat! your colour story is so cute, love the red, pink and burnt orange together!